Pope Francis is visiting the southern Italian towns of Alessano and Molfetta in Puglia to commemorate the 25th anniversary of the death of the popular Italian bishop Don Tonino Bello, remembered for his helping the poor, disadvantaged, and promoting peace. The Pope arrived around 8:30 a.m in Alessano, in the province of Lecce, on the ‘heel’ of Italy’s ‘boot’ from Rome’s Ciampino Airport. Alessano is the town where Bishop Tonino was born and later buried. 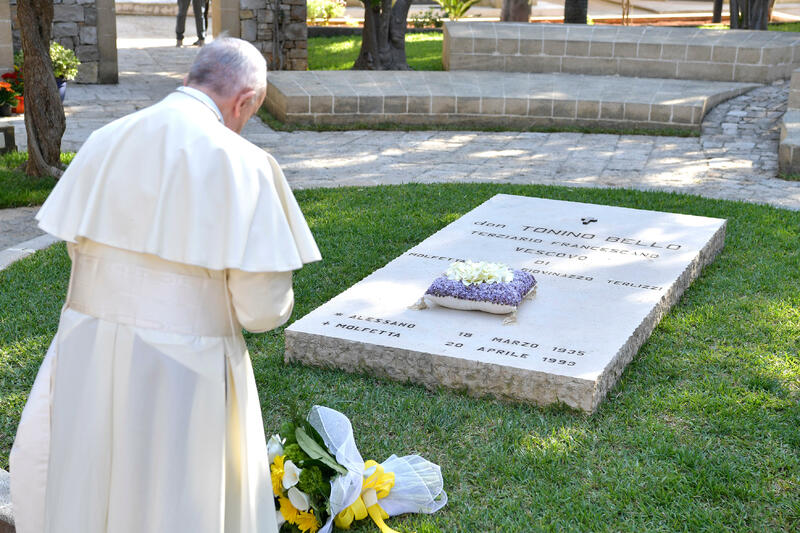 There, the Pope prayed at the tomb of the pastor, loved also for being among the people and without pretenses (similar to our Argentine Pontiff). In 2007, the cause for beatification of Don Tonino, late bishop of Molfetta-Ruvo-Giovinazzo-Terlizzi, was opened. After addressing the faithful of Alessano, Pope Francis flew north to where Molfetta, a port town where Don Tonino was bishop and died. In the cathedral there, Pope Francis will say Mass. He is expected to arrive back in Rome around 1:30 p.m.